Easily one of the most anticipated comics of the second half of 2012 for me, Archie #636 is based around a single plot point - the characters swapping gender - and that's just the main five. Written by Tania del Rio and pencilled by Gisele (also the artist for both covers), it follows the characters as Salem works a spell to change the gender of everyone in Riverdale. 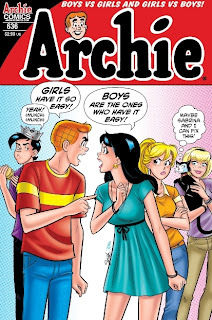 Archie becomes Archina, Reggie is Regina, Jughead is J.J., Betty is Billy and, finally, Veronica becomes Ron. The plot itself was quite strange. Aside from the Sabrina framing, it didn't seem like there was any particular focus. Archina's day was a mix of various smaller things but unlike the majority of Archie stories, it didn't really have a clear story. Billy and Ron barely fought over Archina, the Boys vs Girls argument took up maybe three-quarters of a page in total out of 22 pages. Compare this to the standard cover, which makes a fairly big deal of the argument. The Betty & Veronica novel We're With The Band (you can find my review here) tackled the Boys vs Girls argument too, but it had the benefit of being a 150 page story rather than a 22 page comic and it was more satisfying for it. What happened in this issue felt like a selection of brief moments from other Archie stories without any of the build-up nor the resolutions. The strength of this issue, however, lay in the humour. It had numerous pop-culture and internet meme references, but the puns were also incredibly good (such as Hot Dog's swapped name). In a strange way, the simple plot was almost a strength. 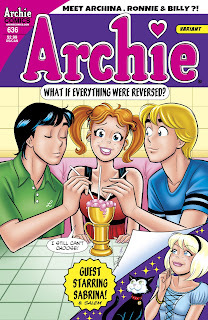 It showed the comic would be pretty much the same if it was truly about Archina and the gang rather than Archie. Gisele also managed to capture the expressions perfectly well. J.J.'s expressions were those of Jughead, Ron's of Veronica and so on. It worked brilliantly, even if many other aspects didn't quite make sense. One 'swap' in particular is rather humorous, though I'll not say who it affects as it has to be experienced. L-R: Archina, Billy, J.J, Regina and Ron. Whilst I think the intention was admirable, the execution sadly didn't quite work as well as I'd hoped. 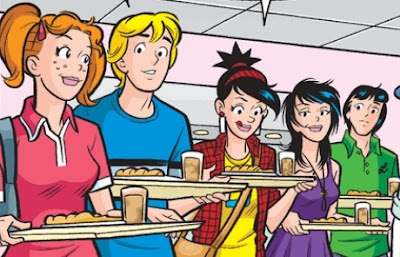 If it was simply an Archie story with reversed genders, it could have been very enjoyable. But it wasn't. It was framed as an experiment by Salem with the marketing and the 'buzz' (and even Archie Comics themselves) adding this other dimension to it. If anything, making it a gender-swap (and Sabrina) story weakened it and took valuable pages away, leaving between 50-66% of the pages to be dedicated to Archina and her friends, and even some of those were used on discussion of the situation and Regina took the focus slightly more often than she should have. All in all, Archie #636 both a great and a disappointing issue, but there is potential there and I hope that Archina, Billy, Ron and the gang come back for future issues. They could be really fun to read if done with a new story over a number of issues, and I have no reason to think that Tania del Rio and Gisele couldn't make it work. I don't regret buying two copies at all, but I must confess that I was hoping for a little more. As my more eagle-eyed readers may have noticed, I removed my tumblr feed from the sidebar. I did this for a variety of reasons, but I've decided to start a new one! This new tumblr, also called The Forged Forest, will exist to compliment this blog, but I'll also use it to share interesting things I find. So far it has armour, period clothing, art and a big green orc lady. You can find my new tumblr here, and it's also in the sidebar below the link to my Goodreads page. 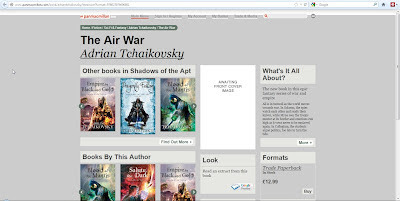 Tor UK goes DRM-free for e-books... Yay? In fairly big genre publishing news, as of today Tor UK have gone DRM-free for their e-books. This means e-books from their store (link takes you to the Pan Macmillan store, which includes Tor) will not have any restrictions. As far as I'm aware, this means they're at least the third major genre publisher to do so - behind Baen and Angry Robot - although arguably the largest. Those who read this blog may remember that I blogged about e-books earlier in the year, and some of those criticisms apply to this too. First, let's compare some pricing. I decided to go for a small variety of authors, one with a large series, another with a hardcover, a third who is classed as a Tor author but his books are published outside of the imprint (on Pan rather than Tor) and finally self-publishing legend Amanda Hocking. As you can see - Hocking is a little bit of a special case, as she was originally self-published and her books have largely retained a low price - there's some fairly big pricing differences. In one case (Miéville), you're paying twice the price for the same book. Tor are not competing whatsoever with the Kindle, which is all the more bizarre when the only dedicated e-reader their store claims it supports is the Kindle. Morality of Amazon and its pricing aside, when you consider the Kindle is the single most owned e-reader on the market, it seems a little bizarre that they're basically selling the same product at a non-competitive price, especially when they claim they really only support the Kindle with their product. How about the store itself? Doesn't that just excite you? No clear indication where it fits in the series, no cover art (despite smaller sizes showing elsewhere) and a preview that gives you quite a bit too much of a preview. 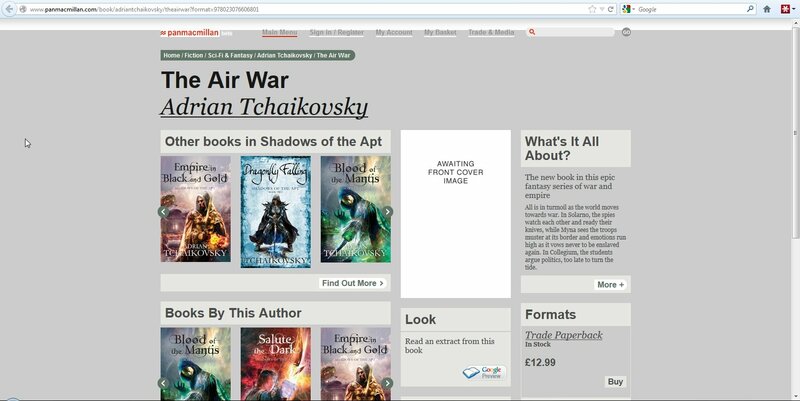 If you can purchase it from Tor UK, there is a small 'Buy' box with the editions listed, otherwise it links you to other vendors. 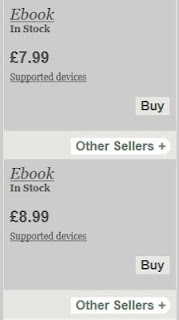 It doesn't even tell you which file type the e-book is, so you're unable to tell if it will or won't work with your e-reader without purchasing it. 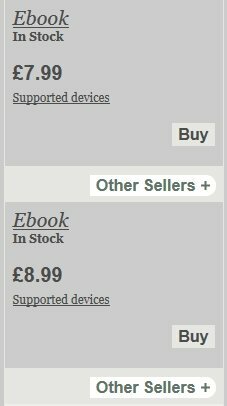 A number of books have no e-book edition available from Tor UK, but still list a price that's equal to the cover price of the average MMPB (so £7.99), so it may direct you to a vendor who sells it cheaper (as most do). You can have the e-book for £7.99 or the e-book for £8.99 (or go to Amazon and get it for £4.86). Clear and sensible, it is not. Compare this to Baen, if you will. Baen offers seven formats for a variety of e-readers and devices with e-reading capabilities. They carry books at a fairly flat rate of $6, even if it's a brand-new hardcover, e-ARCs at $15 (get the uncorrected book ahead of schedule!) and they're all DRM-free. On top of this they offer monthly bundles, containing 5-6 books for $18 - roughly half-price for each book. To compare again with Amazon, they offer free WhisperNet delivery to the Kindle (or you can download the book and add it yourself), one-click purchasing and lower prices. But you're supporting the authors and publisher more this way!Am I? Maybe. They're certainly getting the cost of the book without anything taken by Amazon, Apple, WHSmith and so on, but that's about it. The author may get a little bit more from this, but I would think that two Kindle sales (totalling roughly the same as one book from the Tor store) from, say, Amazon would give roughly the same to the author in royalties but it would also give an extra sale figure, meaning the publisher (or another if the author looks elsewhere) will be more likely to continue publishing that author and/or market their books better. What I'm trying to say is this - Tor UK have the right idea. DRM-Free is a great way to go for all digital media - comics, music, games, video, books - but it's easy to do it wrong, and I feel Tor UK have done that with their move. They've had a chance to bring people to their store rather than go through Amazon, WHSmith/Kobo, the iTunes bookstore and so on, but beyond DRM-free there's no grab. The store is confusing, complex and incomplete, it has very little stated compatibility with other e-readers (what's the point of going DRM-free if you're only supporting the Kindle?) and the prices are high relative to other vendors. There is no grab here for the customer, no feature that really makes the 'extra' expense worth it. Prices could be dropped to match the Amazon ones, and that alone would make it a much more appealing store - and both publisher and author would benefit more than they do from other vendors. But for this store to succeed, truly, Tor UK need to look at their competitors - Amazon, Waterstones, WHSmith, Baen's e-book store and so on. They need a cleaner, clearer, simpler website, but that's the least of their worries. Between the relatively high prices and the lack of supported devices, there's little benefit to the user. With Baen's store you get the book in seven formats, which means the majority of devices are supported - including almost anything with a web browser - for a price not far below that of the paperback editions. That's the direction Tor UK should have taken with their store.